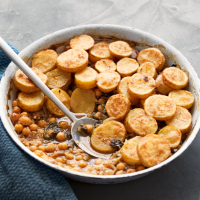 A warming vegetarian hotpot ideal for all the family. Preheat the oven to 180°C, gas mark 4. Heat the oil in a large saucepan and fry the onions, stirring often, for 10 minutes or until golden. Stir in the bouillon powder, 1 tsp of the spice blend, the fennel seeds, chick peas and 300ml boiling water. Bring to the boil, reduce the heat to low, cover and cook very gently for 10 minutes. Stir in the spinach until wilted, season, then turn into a shallow ovenproof dish. Meanwhile, bring a saucepan of water to the boil, add the potatoes and return to the boil. Cook for 1 minute then drain thoroughly and scatter half over the filling. Mix the remaining spice blend with the butter and some seasoning. Brush half over the potatoes. Scatter the remaining potatoes on top and brush with the remaining butter. Bake for 1 hour until the potatoes are crisp and golden.